Shortly after 5 p.m. on a Sunday in early March, about 20 adults gather around a long table in a gallery space in Alexandria, Virginia. Before them are scissors, glue sticks, pastels and colored pencils, and nearby, stacks of old magazines. For the next hour and a half, they cut and paste and color, making collages and talking about what brings them joy, everything from quiet walks in the woods to tables full of oysters and beer. Bible study participants sort through old magazines that they will search for images of "joy." It’s not an art class. It’s Sunday worship at Convergence, an alternative faith community that is both church and arts center. This week, the gathering (“service” seems too formal a word) is a creative Bible study. The Rev. Lisa Cole Smith, the pastor and artistic director, sets the tone with a verse from Matthew -- “Blessed are your eyes because they see, and your ears because they hear” (Matthew 13:16 NIV). A school of dolphins. Towering redwoods. A peaceful shoreline. Jude Law’s come-hither gaze. 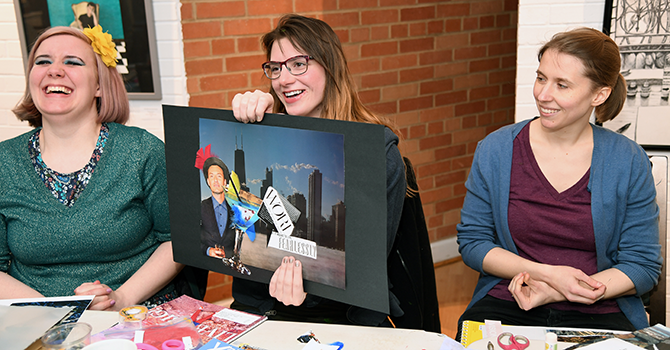 Christina Sorensen (center) explains her collage and how fearlessness brings her joy. The gathering is the first in what will be a yearlong series, “Practicing the Presence of God.” Every other Sunday, members will explore artistic and spiritual practices that can help them see beauty in the ordinary. Bringing together faith and art, it’s a typical event at Convergence. In the decade since the church was founded as a restart for a struggling Baptist congregation, visual arts, dance, music, poetry and theater have informed virtually every act of worship -- and much else of the community’s life together. How can a church be more than a faith community? What other roles could your church serve? Today, Convergence still takes seriously its roles as both church and community arts center. In addition to the worship and discipleship groups that make it “church,” Convergence provides affordable practice, performance and studio space for musicians, dancers, drama troupes and visual artists of all kinds. The point isn’t to lure artists into church; opening their doors to artists is simply what Convergence feels called to do. How can your church support groups doing important work in your community? “Because of our relationship with God and because the work they’re doing is important, we feel compelled to support them,” said Smith, who worked as an actress and director before attending seminary and founding Convergence. Lisa Cole Smith, Convergence's pastor and artistic director, talks with participants before they begin making collages. Smith has always felt connected to God, she said, and in theater, she experienced many of the same feelings she’d had in church. Both evoked a sense of community and working toward something greater than oneself, she said. But artists are by nature inquisitive, and Smith worried that conventional churches often don’t make space for the kind of creative exploration that artists crave. At Convergence, art provides a springboard for spiritual exploration -- and vice versa. How well does your church make space for creative exploration? Artists often feel as though their own beliefs and views don’t fit well with church, but in their art they inevitably think about and wrestle with important issues, Smith said. Convergence is one of a dozen innovative congregations highlighted in “Divergent Church: The Bright Promise of Alternative Faith Communities,” by Tim Shapiro and Kara Faris of the Center for Congregations in Indianapolis. The authors applaud Convergence and the other churches for finding new ways to help Christians explore their faith, connect with God and impact their communities. The congregation is eclectic. Like Smith, some members have an extensive background in the arts; others may never have considered themselves artistic but appreciate the freedom of expression that comes with the church’s creative and inclusive worship style. Whether in Sunday gatherings or in small discipleship groups, people are encouraged to share as little or as much as they want. No question is considered too off-the-wall or inappropriate. 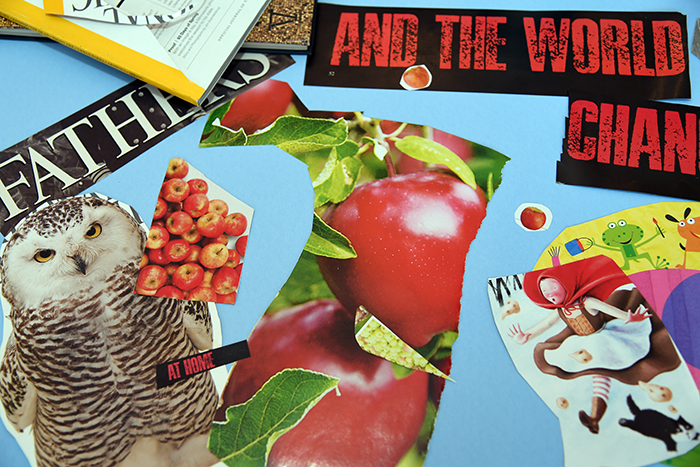 Images of apples, owls, home and "fathers" can lead to discussions about God's call. As the evening drew to a close, the artists talked about their designs, and soon the discussion roamed far beyond images of serene landscapes, birds in flight and gourmet food. The collages prompted a host of questions: How do you live fearlessly? Where do you hear God’s voice the clearest? What are you being called to do? How do you intend to answer that call? Creating art -- or anything else -- almost always takes you to unexpected places, said Kathy Prudden, a licensed clinical social worker and expressive arts therapist who attends Convergence. What role, if any, do the arts play at your church? A core group of about 40 people attend worship at Convergence. Because musicians and other performers routinely work on Saturday nights, the “service” is held on Sundays at 5 p.m. The first and third Sundays are reserved for creative Bible study, when members wrestle with biblical themes such as conflict and forgiveness, doubt and belief, redemption and social justice, by engaging in role playing, composing haiku, studying famous works of art or, as in the March event, creating artwork of their own. Second Sundays feature a contemplative Taizé service, sometimes with an instrumental meditation performed by musicians in the congregation. And the fourth Sunday is marked by a celebratory potluck dinner where members socialize and tackle hard questions: What are you hungry for spiritually? What do you reach for when that hunger strikes? When and how is that hunger satisfied? All of it feels very egalitarian. Though Smith often opens the gatherings with a welcome and scripture, all are invited to participate, get their hands dirty and explore what God is calling them to do and how they will respond. 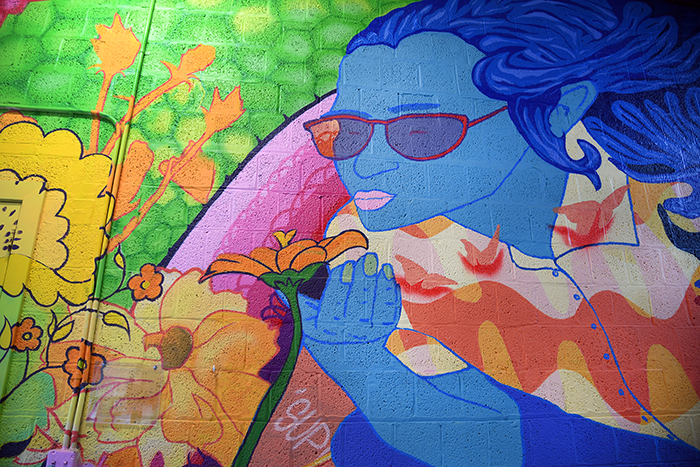 The Convergence community designed and painted this mural in partnership with a D.C. nonprofit in 2013. 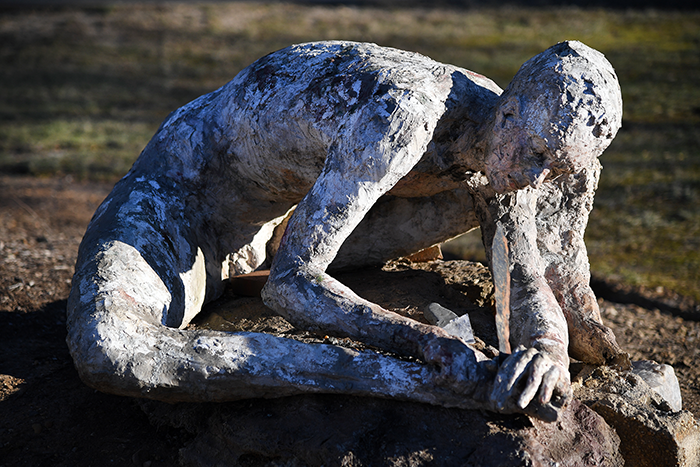 Improvisation is an essential part of that process, said Karen Swenholt, a professional sculptor who has a studio at Convergence and several pieces in its sculpture garden. Because Smith encourages that kind of freedom and movement, unexpected moments take place, where people are clearly affected by what’s happening in the room, Swenholt said. Several members said they had felt stifled in more traditional churches but feel encouraged and affirmed at Convergence. Rita Hadley recalled coming home in tears after small group members at her former church immediately rejected a topic she had raised for discussion. Traditional worship services can be powerful and engaging for those who know and understand the script, Smith said. But they typically lack the immersive, experiential piece that is an integral part of the gatherings at Convergence. Traditional worship is often not very good at explaining the why behind the rituals or very willing to explore that why with worshipers, she said. How well do people at your church understand the “why” of worship? A self-described “theater kid” in high school, Smith studied drama at Carnegie Mellon University and then moved to Los Angeles after graduation to pursue her acting career. Seeking “roles that mattered,” she spent four years touring with the Covenant Players, a professional theater company that performs Christian-themed works at venues around the globe. While on tour, Smith noticed that the shows often evoked a strong response in audience members, even those who weren’t Christians. She wondered whether drama might be a ministry of its own, a way to deliver messages that a traditional sermon could not. After returning to Virginia where her parents lived, Smith spent four years studying the intersection of art and faith at the John Leland Center for Theological Studies, founded a theater group, and consulted with local pastors on how to embrace creative worship. When she graduated in 2006 with an M.T.S. degree, she thought she might continue working with her theater group or pursue a doctorate. “It never even crossed my mind to be a pastor,” she said. That’s when a committee from the 60-year-old Fair-Park Baptist Church approached her. After years of decline, the congregation had voted to explore a complete restart. The committee wanted to know, was she interested in establishing a new vision for the church? The first item on Smith’s list was partnering with local artists to provide affordable space for everything from photo exhibits and theater productions to dance recitals and all-ages do-it-yourself punk shows. While a church service might attract 20 to 30 people, roughly 200 visit Convergence each week to take a class, view an exhibit, enjoy a play or hear a live band. "Monumental Fool" is one of several pieces by Karen Swenholt in the Convergence sculpture garden. 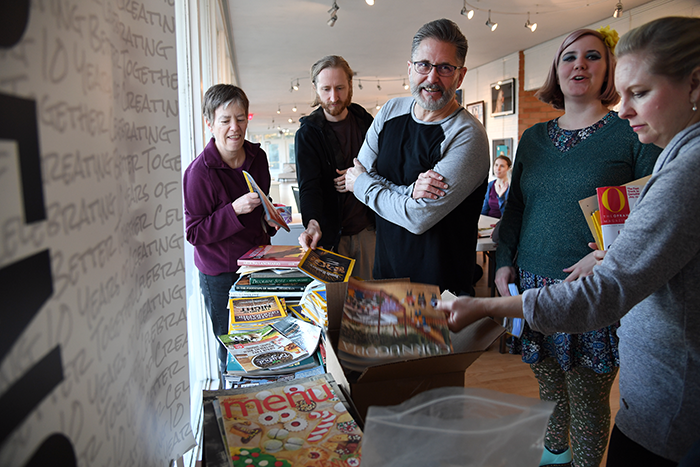 Under the church’s new “Hope Through Beauty” project, launched earlier this year, Convergence plans to link local nonprofits with artists willing to volunteer their services. For instance, several Convergence members lead children in art projects at a monthly food distribution organized by an Alexandria shelter and child development center. When it began, Convergence was given five years to become self-sustaining, and in 2011, trustees for the former Fair-Park Baptist made good on their promise, deeding the building and property to the new congregation. About half of the church’s revenue comes from member support; the rest is generated by renting space to artists and an Anglican congregation that meets in the sanctuary on Sunday mornings. Demand for space in the building is high, and sometimes the church books itself out of its own home. On a recent Sunday, a citywide high school art exhibit filled the gallery while theater productions were underway in the sanctuary and another large space. As a result, the congregation held its monthly potluck celebration in the nearby home of Smith and her husband, Jay, a musician and composer. The couple married in 2012 and have a 2-year-old daughter. 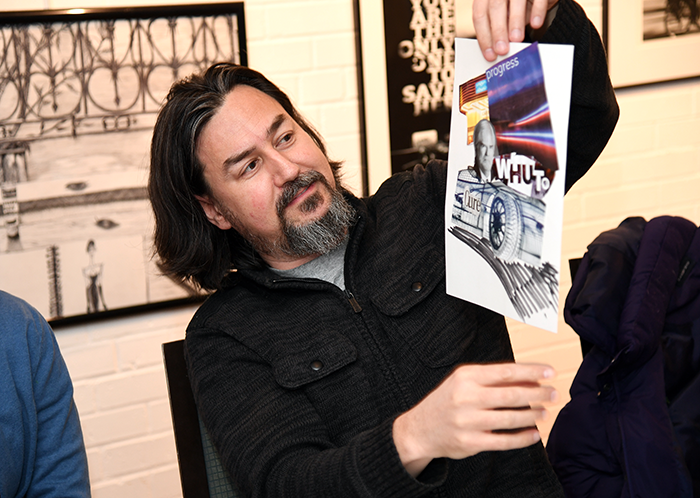 Jay Smith, Convergence's cultural architect, tells other participants about his collage. A member of the Convergence staff since 2009, Jay Smith serves as Convergence’s “cultural architect,” helping ensure that the church’s many initiatives fit within its mission, integrating faith, life and work for members and unleashing imagination and creativity. What is the "cultural architecture" at your church or organization? How well does it fit with the mission? 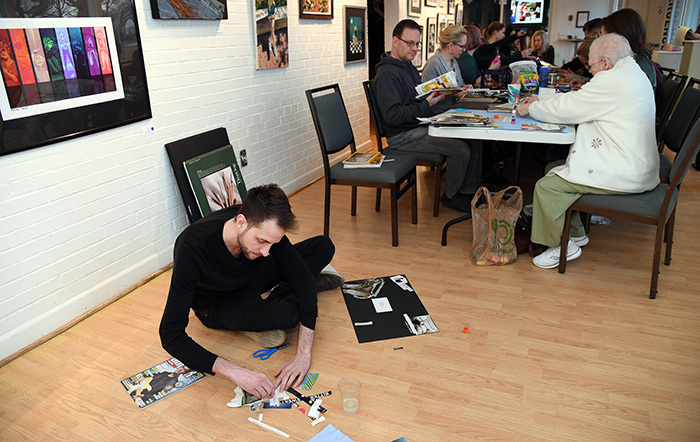 Sitting on the floor, Dan Abh, Convergence's community coordinator, assembles the pieces for his collage. For three years, Abh ran Convergence’s program for young artists as a volunteer, hosting shows, open-mic nights and festivals featuring emerging bands, but he never set foot inside the church’s sanctuary. After losing his two closest friends and his grandfather in a six-month period, a distraught Abh decided to attend a small discipleship group meeting, just to check it out. Worried what his friends in the DIY community would think, he didn’t tell them -- or even his then-girlfriend. But the congregation was supportive, and Abh said he increasingly felt called to be there. In 2012, he traded his longtime job as a store training manager at Trans World Entertainment for a part-time gig as the janitor at Convergence, and in 2015, he became its community coordinator. Ken Hadley and Matthew Kiehl bow their heads as the Bible study/collage-making event closes with prayer. Convergence has a focus on healing, development and action, Jay Smith said. The arts provide a means for moving people “past brokenness,” encouraging them to develop spiritually and challenging them to share their gifts with the world. After a decade, that culture has taken hold at Convergence, and is manifested in the way the congregation engages authentically with each other and the surrounding community, he said. Prudden, the art therapist, said much the same. What groups are doing important work in your community? How can your church support them? Do non-artists also crave creative exploration? How well does your church make space for creative exploration? How well do people at your church understand the why of worship?